This Mother’s Day season, Tim Hortons is offering ChocoSnow Donuts. 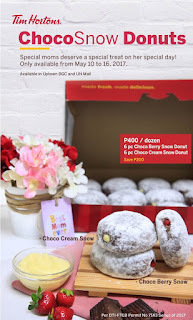 The delectable donut offerings come in two flavors: Choco Cream Snow, and Choco Berry Snow. This treat will be available at Tim Hortons Uptown BGC and UN Mall for a limited time only. Grab it from May 10 to 16, 2017. Pair it with Coffee, Hot and Cold beverages and spend some 'mom and me' time today.